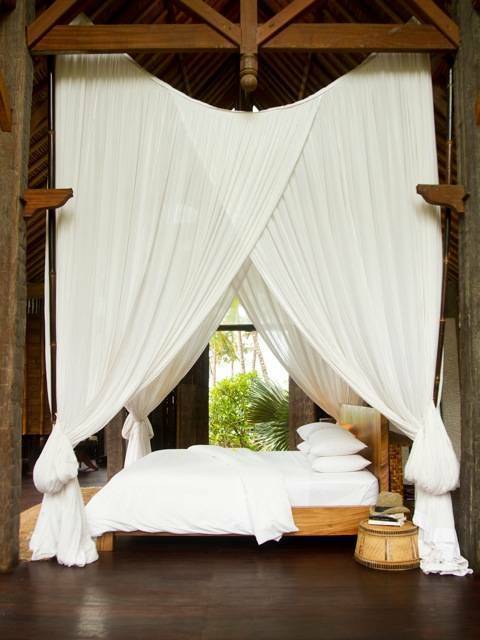 Nestled where two fresh-water rivers run into the Lombok Straights of the Indian Ocean, Villa Campuan was selected as ARCHITECTURAL DIGEST's lead feature in the "Exotic Homes Edition" in August 2009 for its unique design, luxurious appointments and magnificent setting. 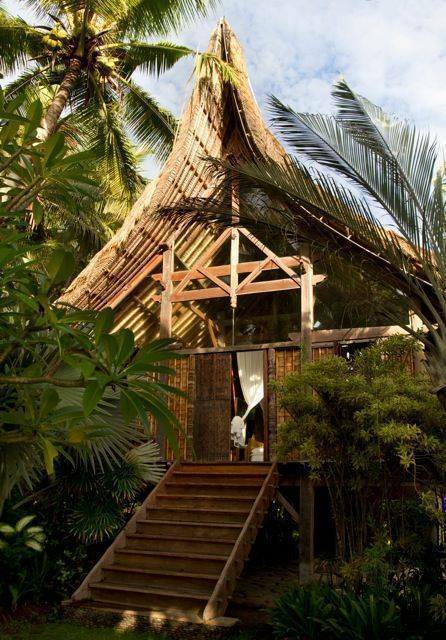 Designed by Linda Garland, built by a team of Sumatran master carpenters, the owners spared no expense in making the home environmentally friendly( built with all re-cycled wood) and seamlessly integrated into the natural setting. In front lies the ocean and behind towers Bali's main 12, 000 foot volcano, Mt. Agung, the 'sacred mother of Bali.' To the North over the terraced rice fields is the Seraya Mountain range whose cooling breezes blow in most nights. Thus the property is a 360 degree experience. 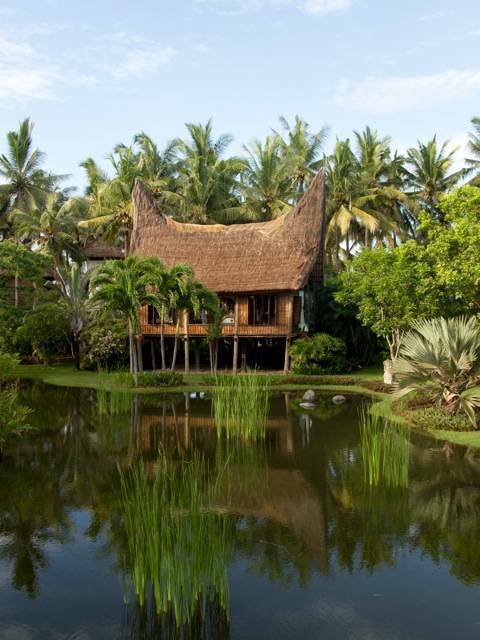 The villa is actually six villas organized at the ocean's edge with 2500 square foot long house which serves as the living room/dining room house for the five bedroom villas, each with its own design and character. 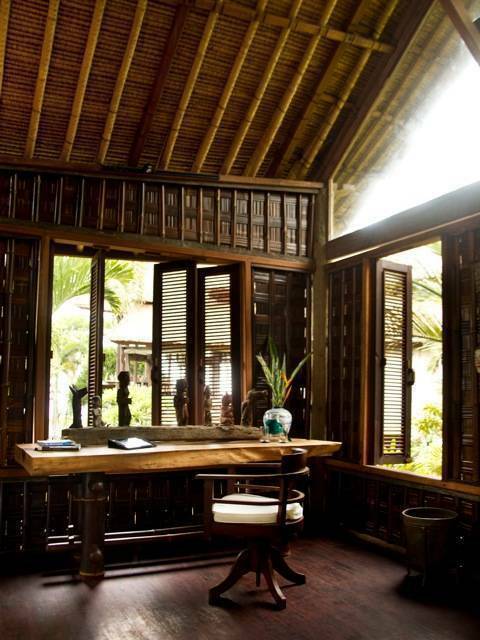 Villa Jasi is a smaller long house in the Sumatran style with a king-sized bed and full bathroom. All villas come with the friendly staff of ten people: two cooks, three house caretakers, three gardeners and two night security men there all day to meet your every need, including cleaning, and a delicious breakfast provided in the price of the villas. Lunch and dinner can be arranged for an additional amount. They are all smiles and will climb the many cocoanut trees to give you some "ayer kalapa muda," young cocoanut milk, or fresh-sqeezed orange juice, Bintang beer or sodas all day. There are surf breaks nearby and surf guides can be arranged by the staff and are recommended to insure happy integration into the line-up. The local break, Pura Delam, can generate waves from two-feet to double overhead depending on the season and the swells. You can see the break from the living room/dining room house to tell what the swell is doing. It's a five minute drive away. There is snorkeling right out front for lobster and sea life observation and excellent diving all over the area including wreck diving in nearby Tabanan. Bali is a haven for all water sports. 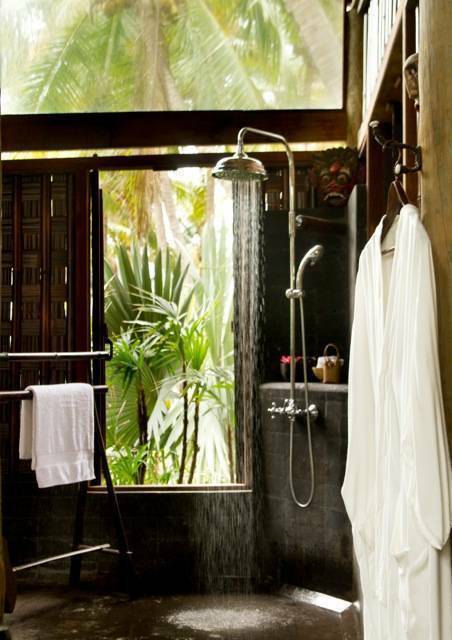 Facials and massages can be had at the villas with notices to the staff and are highly recommended and inexpensive. Also, recommended is to hire a car and driver by the week so that your freedom of movement is assured. It is NOT recommended to drive in Bali as the traffic behavior is quite wild and unpredictable. Cars and drivers are also very reasonable in cost and can be arranged before or after you hit the island. The staff will pick you up at Denpensar Airport and drive you the 1 1/2 hours to Villa Campuan where your smiling staff will greet you warmly and show you to your rooms. 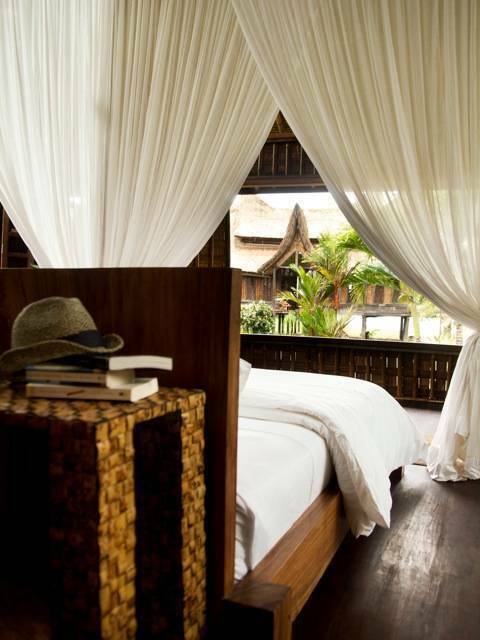 Villa Campuan can be rented in its entirety or by villa depending on the guests' needs. A ten-minute drive away is a often deserted white sand beach (Pasir Putih) about a half-mile long with lovely swimming and a few warungs serving fresh seafood and cold drinks right on the sand. Massages and crafts are also available. East Bali may be the last refuge of the true Balinese Culture where festivals, temple ceremonies, and rice farming abound as they have done for centuries. Women in sarongs carrying temple offerings on their heads along bamboo-lined back roads are sights that will linger in one's mind long after you are back home. Many villages in the area are craft-oriented specializing in silver jewelry, weaving, ikat, fishing, and baskets, all ready to be explored. Many local restaurants abound and both the luxurious Alila Hotel and Aman Kila Hotels are located within 45 minutes and have a number of fine, gourmet restaurants should you want a change of dining pace. Most of all, Villa Campuan offers a chance at renewal, re-invigoration, romance, and recreation in uncommon amounts. Though the journey there may be long, upon arriving only the power of the destination will remain as you have successfully traveled into another world.